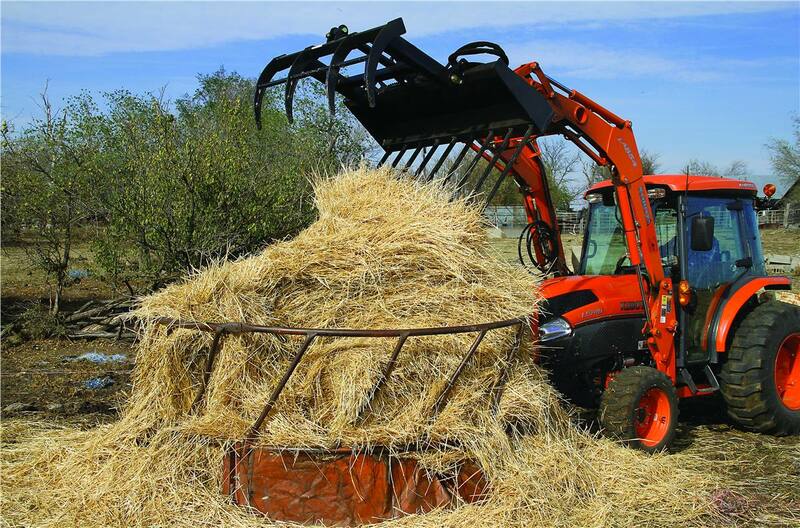 Kubota by Land Pride: The SGM15 Manure Grapple is a must-have tool for hay moving, barn cleaning, or general yard maintenance. 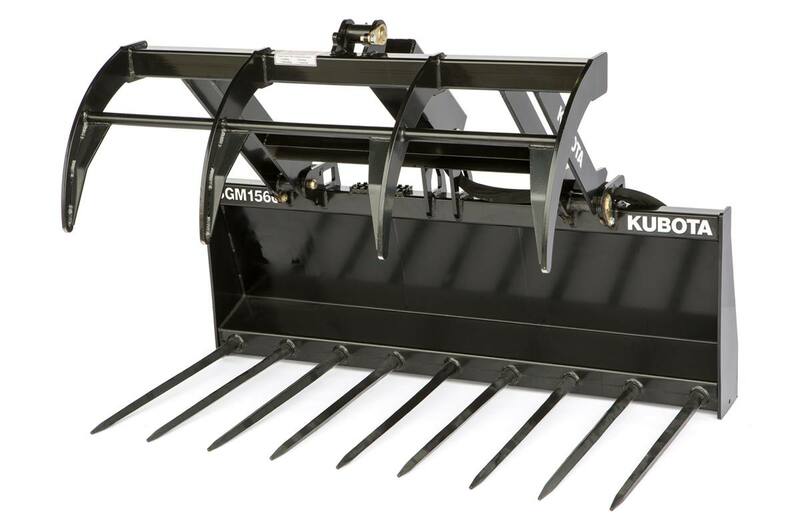 Available in widths of 66", 72" and 78" with 8 to 10 spears, this grapple will make chores around the farm a breeze. Only available through Kubota Dealers. Attaches to power equipment easily: Uses Skid Steer Quick Hitch design for quick and easy attachment. Designed to fit Skid Steer Loaders and Front Tractor Loaders: The quick attach plate mounted grapple can be attached to a wide variety of machines. 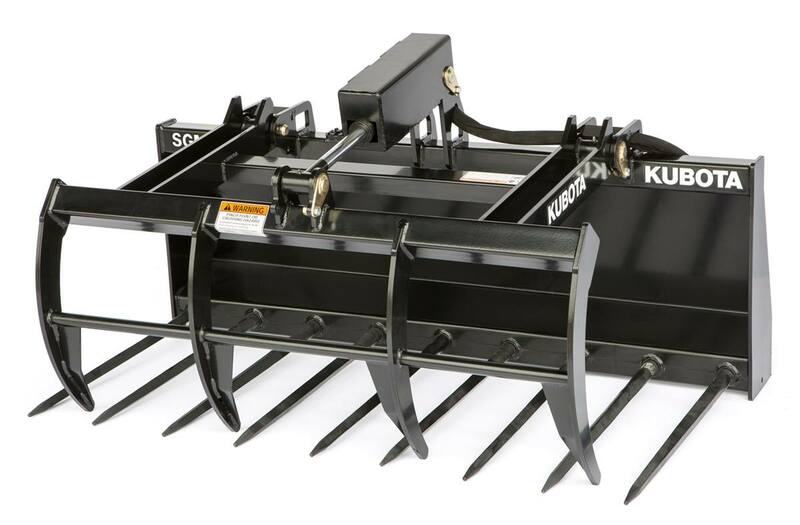 Note: Tractor Loaders must be fitted with a Skid Steer universal quick attach mounting system. Designed to protect hydraulic hoses: Hydraulic hoses routed to prevent pinching. Replaceable spears: Spears can be replaced if damaged. Greasable hardened bushings at pivot points: Bushings can be replaced if needed. 1 1/4" Pivot pins: Large diameter pins for extra strength. Optional cylinder shields: Protects hydraulic cylinder and fittings. Optional upper grapple fork: Grips the material, increases load capacity, and reduces spillage. Lower grapple weight: 427 lbs. Spacing of bottom spears: 8 5/16"
Bottom spear diameter: 1 3/8"
Working length of spears: 30 3/8"
Upper grapple fork weight with optional hydraulic cylinder shield: 199 lbs. Optional Hydraulic Hose Kit Part No. 380-062A: 2 fabric protected hydraulic hoses (99" & 109" long), 2 elbows, 2 straight adapters, and 1 1/16" male and female quick couplers.